We have come to the end of March…and the good news is the swoon that normally would knock the Devils out of playoff contention never came to pass for the first time in the franchise’s existence (well at least here anyway). But the latest 3 in 3 weekend did not start out well, but the team rebounded to grab 3 out of 6 standings points and keep their position in the Eastern Conference playoff race. A critical start to the weekend slate, as the Devils traveled south to Hershey to take on the Bears, a team just on the outside looking in at 9th place in the Eastern Conference. Albany got off to a good start, outshooting the hosts 12-7 and getting a late fluky power play goal off the stick of Stefan Matteau to take a 1-0 lead. After a scoreless second period, the Bears mounted a rally in the third and took control. Dane Byers would tie the game midway through the period on a power play. Chay Genoway would follow five minutes later with a shot off the point that sailed over the shoulder of Scott Wedgewood to put the Bears ahead 2-1. Brandon Segal would seal things with two goals in a span of 58 seconds (one power play, one into an empty net), pushing Albany into 7th place in the conference. Outside of the third period, it was a very good night for Wedgewood, who finished with 22 saves on 25 Hershey shots. 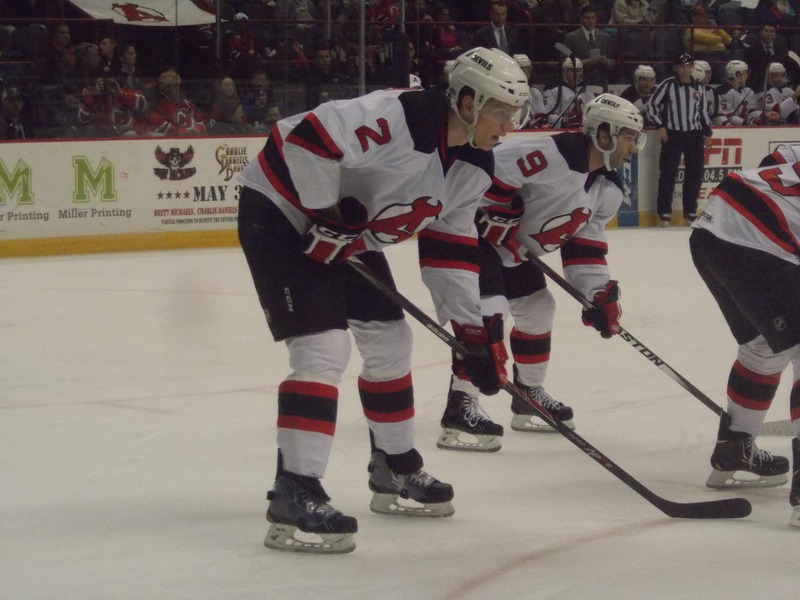 Kelly Zajac and Mattias Tedenby had the lone assists. It was back on real home ice for the first time in10 days as Albany welcomed the Sharks for its only visit of the season. On a day where Union College was advancing to the Frozen Four in Bridgeport, it was only fitting that the goalie matchup was two recent alums, Keith Kinkaid for Albany and Troy Grosenick for Worcester (and a rematch of March 9th in central Massachusetts, a game won by Worcester in a shootout). Stefan Matteau would get the home team on the board in the first with his second goal in 2 days and 13th on the season. 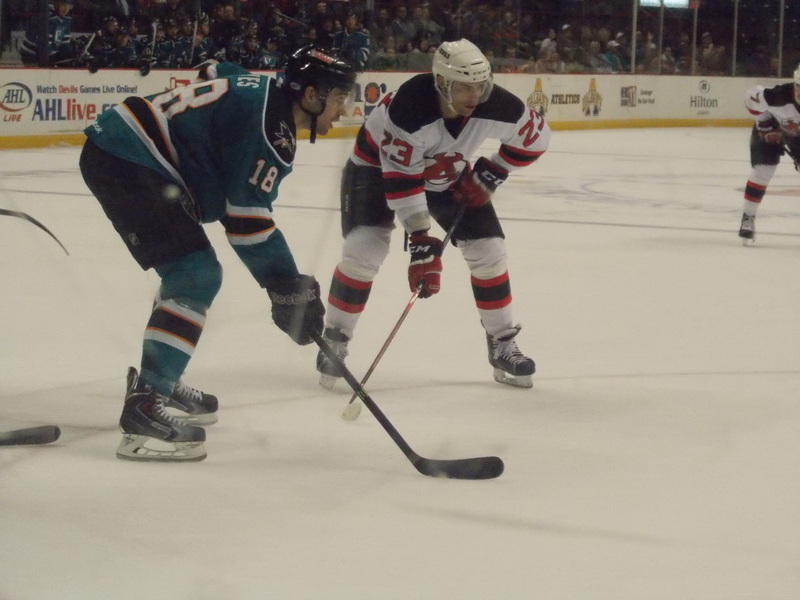 Just as the Sharks would tie things up, Mattias Tedenby answered 21 seconds later with his 9th for a 2-1 lead. Worcester would re-tie the game at 2 just as the first period was ending, then took their first lead 6 minutes into the second period. 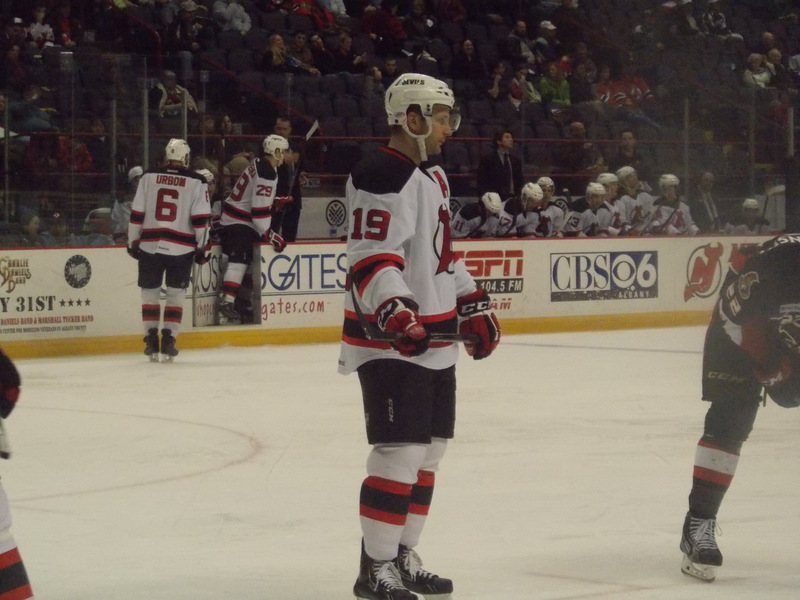 But Kelly Zajac would answer with a power play goal past his former college teammate later in the period to re-tie the game at 3. And it would stay that way, through the third and into overtime, leading to another shootout showdown between the Union goalies. Kinkaid allowed only one goal, to Dan DaSilva, in the 3rd round. But Grosenick would stop Reid Boucher, Mike Sislo, Tedenby, Matteau, and Joe Whitney in the final round to pick up the extra point for the Sharks. Kinkaid finished with 28 saves on 31 shots. The line of Tedenby, Zajac, and Matteau provided virtually all the offense, with just Alexander Urbom and Scott Timmins contributing one assist each. To finish off the latest 3 in 3 and a brief 2 game homestand, the Devils welcomed the Senators, who had just taken over first place in the East and the #3 spot in the conference. Matt Puempel would put the B-Sens ahead 6 minutes into the first. Reid Boucher would tie the game on a power play midway through the second. Alex Grant would take the lead back with a shot from the point with just under 3 minutes to go in the period. David Wohlberg would then re-tie the game midway through the third. 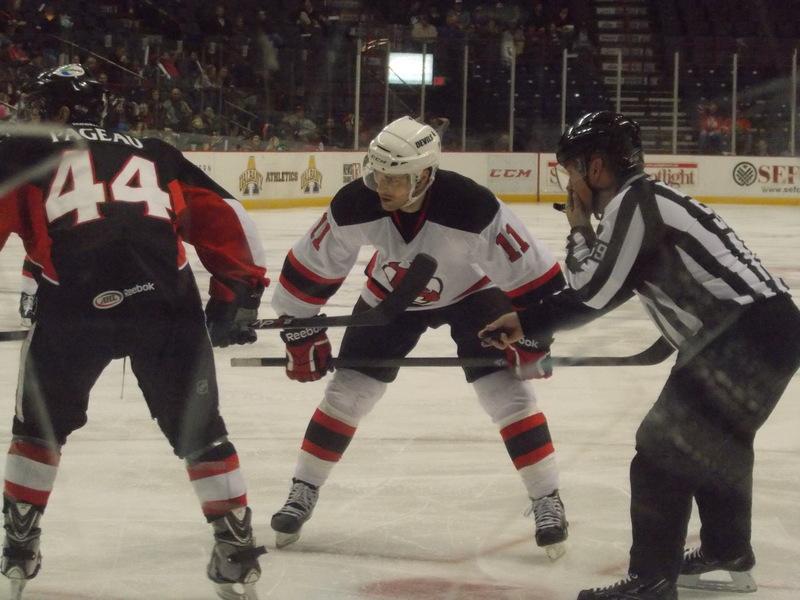 The game would carry over into overtime, where despite a 4-0 shot advantage, the Devils could not get the game winner past Senators goaltender Scott Greenham. It was on to the shootout for the second straight day, where Greenham and Scott Wedgewood would stop all 4 chances each in the first four rounds. In the fifth round, Rod Pelley stepped onto the ice (in a change of pace, I guess) and got one past Greenham. Wedgewood would stop Derek Grant to finish off the win and get the all important extra point, which pushed Albany back up to 6th place in the conference. Wedgewood had a much better outing compared to Friday night, stopping 23 of 25 shots in 65 minutes and all 5 shootout attempts. 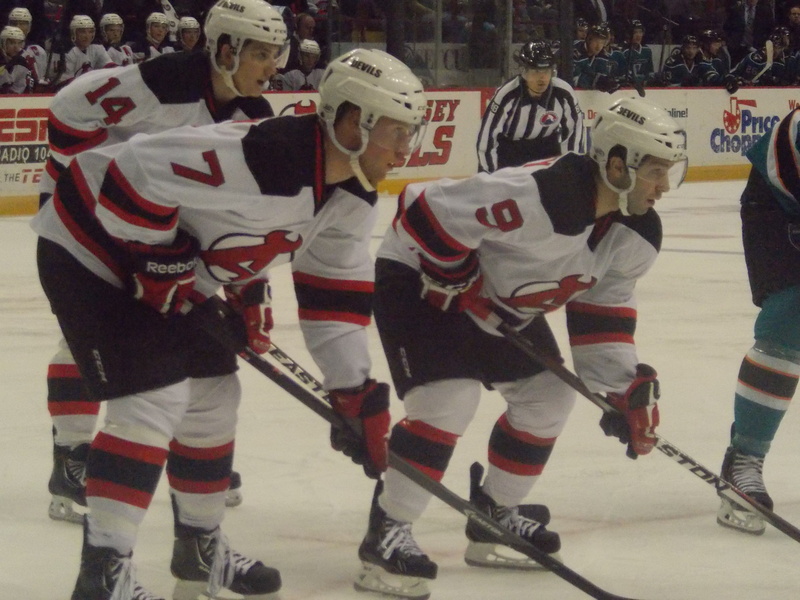 Four Devils each had assists. And only two penalties were called the entire game, all on Binghamton…no penalty kills to speak of. Knowing the history of the Bears, I would not completely count them out just yet. They have not missed the playoffs since the ’04-’05 season, when they were affiliated with Colorado (Washington took over the following season). Especially after their performance on Friday night. Albany’s magic number to clinch a playoff spot stands at 13 as we enter the month of April. No March swoon this year, finally! No gloves dropped this week. Instead of one player, I’m giving it to one whole line…the line of Mattias Tedenby, Kelly Zajac and Stefan Matteau, who have been on a roll recently. They were responsible for virtually all the offense the first half of the weekend. Not a good weekend for the Jackals, as they were swept in a 3 in 3 by Reading and Wheeling, putting their record at 22-36-3-5 with 6 games to go in the regular season. 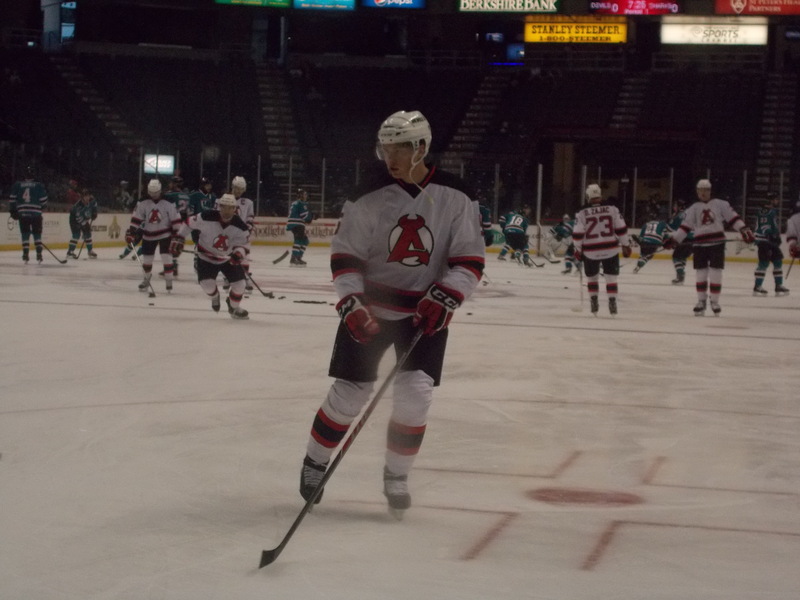 Artem Demkov returned to the lineup on Saturday and scored in back to back games. Harry Young even had a goal on Friday night, breaking up a Reading shutout bid in the third period. As for the Solar Bears…a much better showing, as they went 2-1 against Cincinnati and Evansville to put their record at 40-22-2-2, good for first place in the South Division and third in the Eastern Conference. An up and down week for Maxime Clermont, as he got the start Wednesday against the Cyclones and was pulled in the second period after stopping 22 of 27 shots. He got a chance at redemption Saturday night at home against the IceMen, coming in relief in the second period and stopping all 12 shots faced in a 5-4 win. An all road 3 in 3 weekend starts the month of April. Friday night the Devils travel west to Syracuse to play the Crunch. Saturday night it’s south down Interstate 81 to Wilkes-Barre for a crucial matchup against the Penguins. Finally, back north Sunday afternoon to Glens Falls for the final matchup against the Phantoms (be sure to have your Billy Joel ready!). Also this week…the annual Awards Banquet on Tuesday, I’ll have an entry up about that by Wednesday. Where: Times Union Center, Albany, NY. Where: Giant Center, Hershey, PA.
Tuesday: With Ryan Carter nursing an upper body injury, Tim Sestito was recalled to New Jersey and took Carter’s place on the fourth line in the Devils loss to the Bruins. He left the game Thursday night after taking an elbow to the head against the Wild, no timetable has been given on his return. Albany closed out a 3 game homestand with a visit from the Senators, who began the night in first place in the East and holding down #3 in the conference with Wilkes-Barre and Norfolk very close behind. Scott Wedgewood drew the start, looking to extend a personal scoreless streak of 126:50. He added 20 minutes to it, as both teams went scoreless through the first. 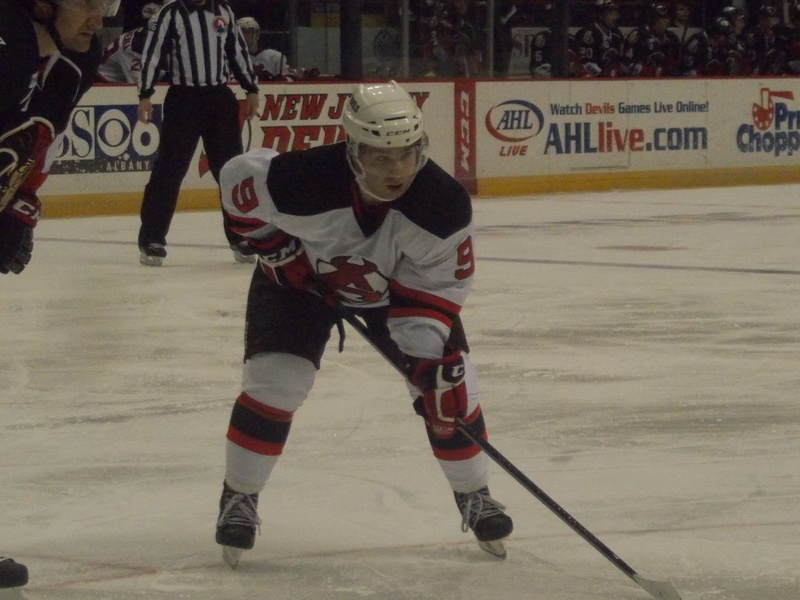 Second period saw Albany outshoot Binghamton 9-2. But one of those 2 shots, off the stick of Matt Puempel, would find its way past Wedgewood while on a power play to give the Senators a 1-0 lead…and stop Wedgewood’s streak at 162:44. Third period the Devils would start a comeback, as Reid Boucher would score on a power play to tie the game up with just over 7 minutes to go in regulation. Then with under 3 minutes remaining, Mike Sislo would take the pass from Harri Pesonen and score a beautiful breakaway goal, his 22nd of the year, to give Albany a 2-1 lead. The Senators would pull the goalie with less than a minute to go while killing a late power play, but were unable to tie it up, and Albany skated away with its third straight win, moving them up to 6th place in the conference. Another relatively easy night for Wedgewood, as he stopped 18 of 19 shots. Pesonen and Scott Timmins each added assists. 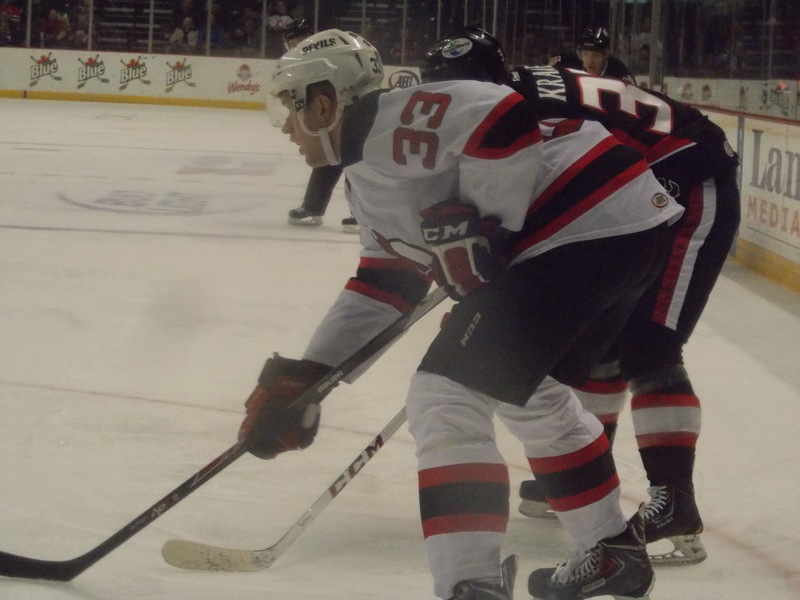 The Devils headed west on the Thruway to Syracuse on Saturday evening to take on the Crunch for the second time in 6 days. The visitors came out flying in the first period, scoring three times. But what’s interesting here is where the three goals came from. Raman Hrabarenka opened the scoring with a shot from the blue line 3:28 into the game. Adam Larsson followed with a goal of his own from near the same location 5 minutes later. Alexander Urbom capped off the scoring with his first of the season, almost in the same spot, late in the period. Reid Boucher padded the lead with his 18th early in the second. Syracuse finally got on the board on a Brett Connolly power play goal to cut the lead to 4-1. 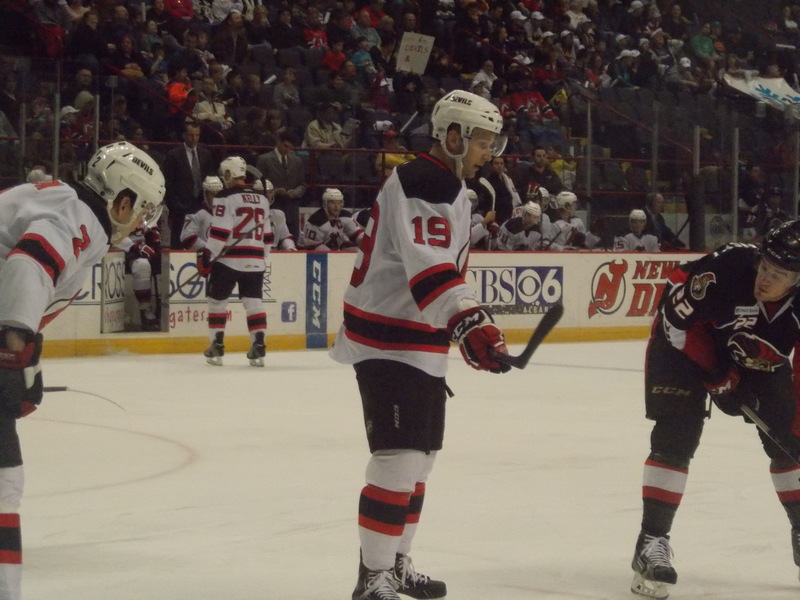 But Kelly Zajac would follow with a nice breakaway goal just after an expiring penalty kill to regain a 4 goal lead. Mike Sislo would add his team leading 23rd goal on a power play early in the third to make it 6-1. The Crunch would get one back on a 5 on 3 advantage late in the third, but that was all they could muster as the Devils won their fourth in a row. Another strong outing from Scott Wedgewood as he stopped 22 of 24 shots. Joe Whitney had two assists, while four others, including Cam Janssen in his first game back since February, added one helper. And everyone finished at worst a +1, Urbom finished a +3 on the night. It was back to Atlantic City for one last time as the Devils played host to the Penguins, a team they were tied with points wise, but the Penguins held the tiebreaker due to more ROW (regulation/OT wins). Chuck Kobasew put the Penguins on the board nearly halfway through the first on a power play goal. 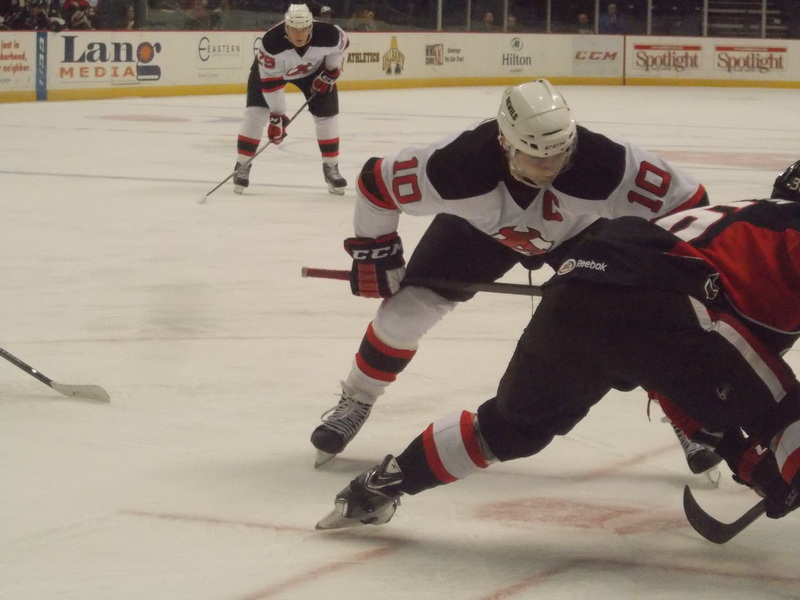 After a scoreless second, the Devils would mount a rally in the third, similar to Wednesday night against Binghamton. Adam Larsson scored his second goal in as many days42 seconds in to tie the game up at 1. 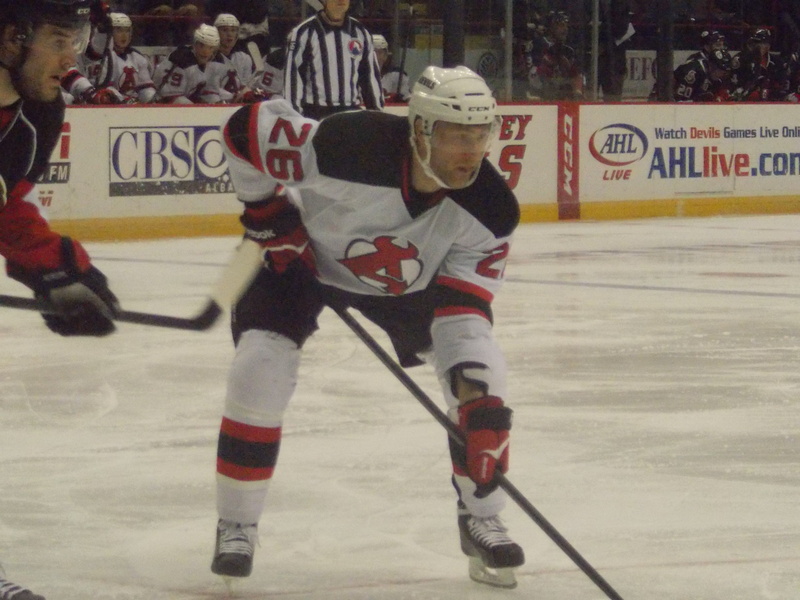 Darcy Zajac would follow that with his first goal of the season to put Albany up 2-1. But unlike Wednesday, when the Devils held on to win, the Penguins would spoil the comeback bid. Brendan Mikkelsen would put one past Keith Kinkaid (in his first appearance in 9 days) to tie the game at 2 with 1:04 to go in regulation. It was on to overtime, where just 1:22 in the Penguins would chip away and Kobasew would poke it in the net for the game winner and the all important extra standings point. So in a span of 2:26 the Devils went from having a regulation win and a jump into 5th place to just gaining one point and staying put in 6th. 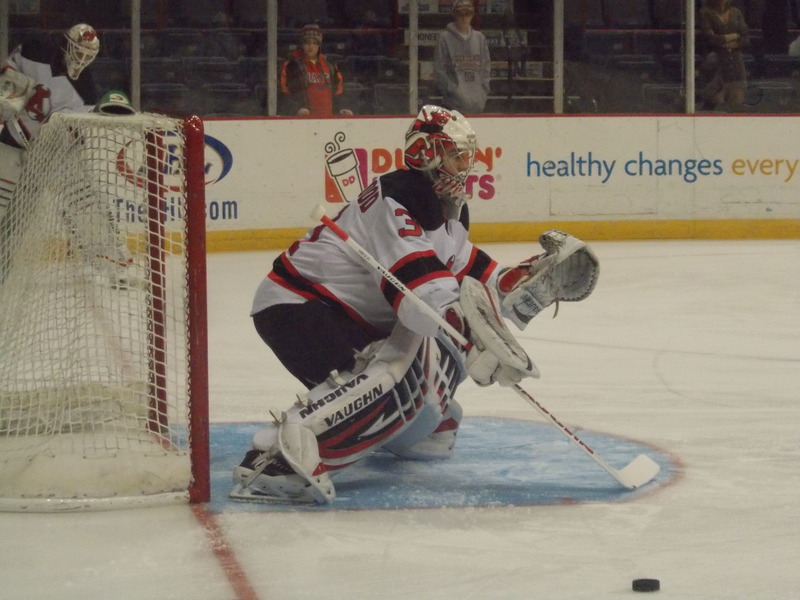 Kinkaid stopped 19 of 22 shots, while Scott Timmins picked up the lone assist of the day. If I did the calculations right, the magic number to clinch a playoff berth stands at 16. And something else to keep an eye on: with the regulation point and a loss by Springfield, the Devils are 5 points behind the Falcons for first place in the division. One fight, but still waiting on the video evidence. This was a hard one, with a few candidates to choose from. But I have decided to split it between Mike Sislo and Adam Larsson, both with two goals and an assist on the week. Honorable mention to Scott Wedgewood who has been on a roll with a 4 game winning streak. Not a good weekend series for the Jackals, as they were swept in a pair of games in Cincinnati to see their record fall to 22-33-3-5. Riley Boychuk had one assist in a 4-1 loss on Saturday. Harry Young was a little busy, compiling 11 penalty minutes in the two games. As for the Solar Bears…they went 2-1 on a road swing through Fort Wayne and South Carolina. Maxime Clermont made one appearance, a Saturday night shootout victory in South Carolina, stopping 33 of 36 shots in regulation/overtime and 4 of 5 shootout attempts. Orlando stands at 38-21-2-2 on the season, good for 4th place in the Eastern Conference. Another 3 in 3 weekend to finish out the month of March. Friday night the Devils travel to Hershey to take on the Bears, who are just on the outside looking in. Saturday it’s back on home ice to take on the suddenly surging Sharks in their only visit to the Capital Region. Finally on Sunday afternoon Binghamton pays their second visit in 11 days.